When you have millions of songs at your disposal, the trick is figuring out what to listen to. I’ve always appreciated the way Rdio makes it easy to see what’s popular among your friends and alerts you to new releases by artists you already like. On Thursday the streaming music service launched a redesign across its website, desktop players, and mobile apps, rebranding your collection as your Favorites, all the better to include playlists, stations, and your favorite artists’ entire catalogs. The redesign really simplifies the menu options, which is especially good in the mobile app. In the left-hand menu drawer, suddenly I can tap the link for my Playlists without having to scroll down. Trending takes the place of Heavy Rotation, which lets it be more inclusive: While Heavy Rotation focused on albums, Trending can include anything. Tabs let you select Everyone (pro tip: “Everyone” has questionable taste), and People You Follow. The ellipses button in the top-right lets you filter the Trending list to albums, songs, artists, playlists, and stations. So if you liked the Heavy Rotation view (and I did, since I only follow people who like awesome music), you can re-create it in Trending by filtering by albums and tabbing over to the people you follow. 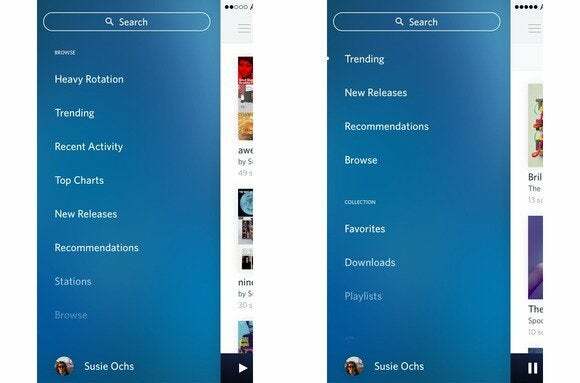 Rdio’s mobile app has a slimmed down sidebar, as you can see in this before-and-after. The Browse menu is all about stations: If you want to listen to curated playlists by genre, theme, and mood, start here. I tend to just listen these for inspiration when I really don’t know what I feel like hearing. But if you follow cool people, you can check out their stations too, for a sampling of what they’re into lately. Then as the songs play, you can tap and hold any song or album for more options, like viewing the song on its album, adding it to your Favorites, and so on. On the desktop and web players, I really miss two things from the sidebar: the History option, and the list of all my playlists. There’s still a Playlists menu option in the sidebar that shows a long list of your playlists in the main window, but since sidebar has a lot more vertical space before you have to scroll, I’d love to see that white space filled up with my playlists once again, saving me a click every time I want to launch one. Or at least give me a grid view of the playlists in the main window. As is it now, there’s a lot of wasted space. Update: After reaching out to Rdio on Twitter, it turns out the History menu is still present in the mobile and desktop apps, just cleverly hidden. To find it, open the left-hand sidebar, scroll down and tap your name, and then scroll to the bottom of the profile page that pops up. Similarly, in the desktop and web apps, click your name in the upper-right corner, and you’ll see a History menu on the right side of your profile page. I’m glad it’s not gone, but I’d love for it to be back in the sidebar, just a click away. So much white space. I miss seeing the names of my playlists in the right-hand sidebar. And wouldn’t the list in the main window look better as a grid? As in the mobile apps, old “collection” is automatically imported into your Favorites. You can add whole artists to your Favorites now, which is a nice touch. Playlists you’ve subscribed to from other people are in the Favorites list too. But I do miss the Recently Added option in the old collection menu—both Recently Added and the History menu were great for quickly locating the stuff I’ve been grooving on most recently. Some customization options would be most welcome in the desktop players: Let me choose which menu items I want to see, even if the resulting interface doesn’t exactly match the clean and uncluttered mobile design. Rdio has a free tier with 30 million songs, letting you listen to albums, playlists, and stations all you want as long as you’re willing to hear some ads. 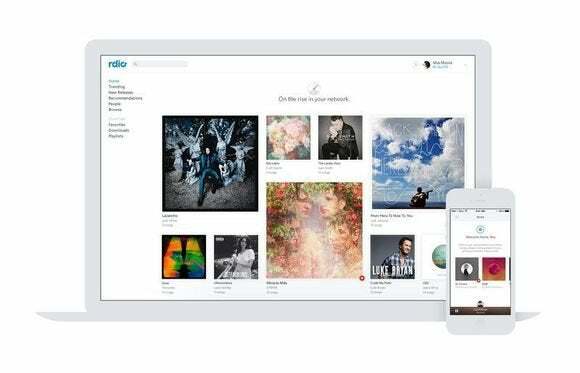 On the mobile apps for iOS and Android, Rdio Free users can listen to free stations, but can’t rewind, and can only skip six songs per hour. 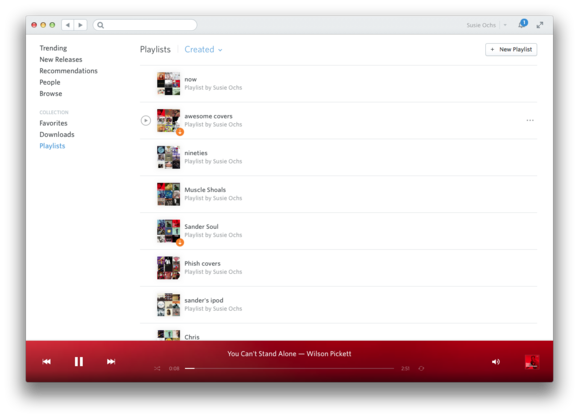 For $5 a month, you can use Rdio ad-free in a browser or desktop app. 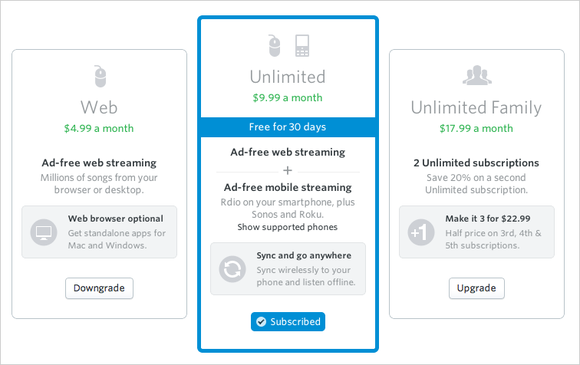 And for $10 a month, Rdio Unlimited offers ad-free streaming everywhere: the web, the mobile apps, even on streaming gear like Roku and Sonos. Families can get two unlimited subscriptions for $18 per month, with further discounts for each additional subscription, and students get half off too. If you just want add-free Rdio while you’re at your computer, the $5 web-only tier is something Spotify doesn’t offer. These prices are comparable to Spotify and Google Play Music All Access, so it mostly comes down to preference. (T-Mobile just added Rdio to its roster of Music Unlimited services you can listen to without hitting your data cap, leveling the playing field with Spotify just a little more.) I love Rdio’s clean, white design and well-integrated social features, but if my Rdio friends all suddenly jumped ship for Spotify, it would be tempting to switch. Streaming music is a crowded market these days, and it’s too easy to subscribe to the free tier of a few different services and jump between them when the ads get annoying or you bump up against the hourly skipping restrictions. I’ve found Rdio’s collection-building tools and easy discovery of music my friends like worth paying for, but I’m not sure this redesign will move the needle in attracting new users. Updated at 2:55pm Pacific to correct information about the History menu. It’s not gone; it just moved.